Dr. Maryam Seifi received her B.S. in Biology from the University of Maryland, College Park in 1986. She went on to receive her Doctorate of Dental Surgery degree from the University of Maryland, Baltimore in 1990. While attending the University of MD, Dr. Seifi worked as the Lead Dental Assistant at Columbia Dental Center and the University of MD Dental Lab Technician. She also served as a University of MD Dental School Admissions Board Member, was an Honorary Admission to the Prosthodontics and Cosmetic Clerkship and served as the President of the American Women Dental Association. Dr. Seifi purchased and opened her private practice in 1991 and was Associate to Dr. Lou in Maryland from 1994-1995. Besides dentistry, Dr. Seifi supports the Foundation for a Drug Free World, Foster Kids Screening for Montgomery County, Maryland Special Olympics, dental screenings on Special Olympic Athletes and the American Cancer Society. She is a member of the American Academy of Cosmetic Dentistry. Dr. Seifi is so caring and professional. I truly respect her professionalism and clinical knowledge. The most compassionate and competent dentist I know. I have known Dr Maryam Seifi for over 10 years. I have always found Maryam to be very caring, very ethical and a very upstanding person. I have seen her go out of her way to help others and to always be wanting to better her community. Dr Seifi is highly proficient, knowledgeable, caring and devoted to a paradigm of complete care. Here strategy of dental management has had a major impact on the quality of my dental health. I actually look forward to going to the dentist. Thank You Dr Seifi! Dr Seifi is a sincere, honest and caring individual and thatâ€™s why I send my kids to her to get treated. What more can one say to recommend someone? Dr Seifi is extremely caring, very professional and proficient. She just does excellent dentistry! Her expertise is in cosmetic dentistry and I would completely trust her to treat me as a patient any day. Probably one of the kindest, most caring professionals I know. She is also a great clinician because she really takes pride in her work and pays attention to every detail- she is great! I have worked with Dr Seifi in our mutual social activities for over 6 years. I have found her to be very honest, cheerful and pleasant to work with. I have worked with Dr Seifi on several occasions and found her to be very good at what she does, in particular I was impressed with her patient presentation. I would let her do treatment on me as a patient and that is a high compliment dentist to dentist- she is pretty good. I have known Dr Seifi for many years. She has a natural ability to make patients feel comfortable and safe. She is very empathetic and understanding both as a dentist to her patients and as a colleague/boss to her associates/employees. She has a very unique way of not only being an authority figure who demands respect, but also a friend who you can joke/pal around with- both at the same time. She is simply an outstanding person. I have known Maryam Seifi for many years and have always found her to be quite pleasant, engaging and personable. She is thoughtful and considerate as well- always interested in hearing about how Iâ€™ve been and how my family is getting along. Thereâ€™s not much doubt in my mind that she is very diligent and conscientious in her professional life, too- always scheduling appointments so as not to interfere with work commitments. Yes, in my humble estimation, she ranks 5/5 on the personal/professional scale! Dr Seifi is my favorite dentist ever! She is so sweet that it takes the fear out of sitting in the chair- and she really made my visit painless! I have known Dr Seiif for many years now. I love her energy and enthusiasm and dedication to dentistry and patient care. She should be the dentistâ€™s dentist. I give her 5 out of 5 stars. 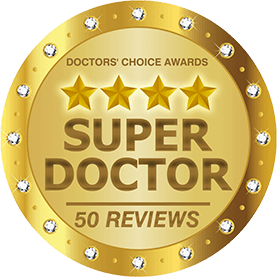 Dr Seifi is a super skilled clinician and runs a top-notch office. Dr Seifi is a compassionate and quality focused dentist who believes in comprehensive care for her patients. She is a strong leader who commands respect from her team members but is congenial enough to gain their admiration as well. I have known this accomplished dentist for years. She is both skilled and compassionate about her patients and profession. Iâ€™ve known Dr Seifi for many years. She has the knowledge & professionalism you would expect from your dentist and the energy, patience and high spirit you would love in a friend. That is why I have been referring my family members to Dr Seifi and highly recommend her(and the StarBrite Dental office) for anyone who wants to get quality care in a friendly environment. 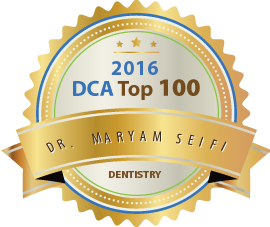 Iâ€™ve known Dr Maryam Seifi professionally for many years and she is an absolutely outstanding dentist. Her professional knowledge & technique are unsurpassed. Dr Seifi is a very good friend, caring mother and grandmother. I respect Dr Seifi. I think she is not only a very good dentist but is very determined. I have known her for 10 years and I refer my own patients to her. I had the opportunity to work with Dr Seifi at the beginning of her career and also more recently. I found her to be professional, able and very caring. She knows what she is doing and is very good at it. She always strives for the betterment of society by doing the best dentistry possible. The thing that is most evident to me about Miriam is her positive attitude. She always has a smile on her face, and is willing to do whatever is necessary to accomplish her goals. She has the attitude that she can make happen whatever it is she wants to have happen, and that is very inspirational. She loves and supports her family to help them achieve their goals as well. She works tirelessly to achieve success in life, and is definitely a positive role model for women. 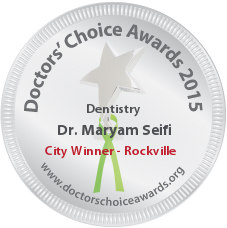 I highly recommend Dr Maryam Seifi for the Doctorâ€™s Choice Award. She is an absolutely talented, skilled and compassionate dentist and certainly deserves this recognition. Her passion to excel in the field of dentistry both technically and professionally is remarkable. Sympathetic, knowledgeable, professionally gifted, dexterous. I have known Dr Seifi for the past few years. She is a wonderful person & dentist. 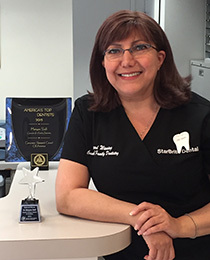 Her care & commitment to helping patients achieve good oral health is inspiring. She workswith a great team & has a great practice! Dr Seifi does very good work- Iâ€™ve seen it as I have sent my patients there. She has even done work on my family. I have been working with Dr sieif for over 15 years. She is very detail oriented and takes exemplary care of her patients. Dr Seifi is a skilled, intelligent and compassionate dentist. Her advanced yet conservative practice philosophy is admired by her peers and appreciated by her patients. I am happy to nominate her for this award. I have known Dr Seifi for many years. She is very professional and conscientious. She stays ahead of the curve with the latest dental technology and has high standards. She is well liked by her patients and is assisted by an excellent team at the office. I have known Dr Seifi for the past sixteen years. She is not only a friend and a colleague, she is also my dentist. Dr Seifi always strives for the highest level of excellence personally and professionally. She cares for her patients and provides them with the best possible dental care. It is a pleasure to call her a colleague and a friend. I have known Dr Seifi for over 34 years and in all these years I have found her compassion and integrity to be second to none. Dr. Seifi is an outstanding doctor. I am a dentist and would travel from Western Pennsylvania to visit and be treated by Dr. Seifi. Her skills are only out-weighed by her caring and professional demeanor. She treats all of her patients with a level of kindness and thoroughness that it permeates the entire staff and her office. Dr. Seifi is a highly competent Dentist and did great work for my family. she is also honest and caring and loves what she does. I would highly recommend her to anyone looking for a dentist. Dr. Seifi is ethical a professional that treats individual not teeth or smiles. We need more professionals like her. Dr. Seifi is one of the most brilliant, compassionate and trustworthy dentists I know. Every time, I have a difficult question, I pick up the phone and I consult her. I truly value her opinions and judgement and trust her with every situation. On a more personal more, she is the kindest person I know in my life. She has an amazing passion for life and brings a lot of joy and happiness to everyone around her. A very pleasant and caring dentist. 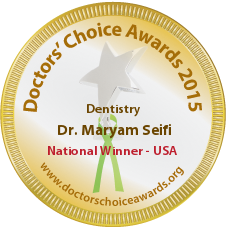 Dr. Maryam Seifi is not one of those dentists who has a dental office, working her regular days as an ordinary dentist. Dr. Seifi is an angel, both as a person and as a Dentist. She has touched so many hearts, has spent so much of her own time for those who needed help. As a dentist she is very knowledgeable and is an expert dentist which amazes not only her patients, also her other co-workers. Excellent skill, professional as well as very personable. She is very caring and wonderful person. Dr. Seifi is excellent. She provides high quality, detail oriented, thorough and compassionate care to all of her clients. Dr. Seifi is a wonderful clinician and accomplished practitioner. I came to know her through an unfortunate emergency dental procedure, and since this meeting – more than 4 years ago. She has become a trusted confidant and friend. it is my pleasure to provide my recommendation and highlight her success! One of the best I have known. She really cares about her patients, is very knowledgeable one of the best in the nation. Dr. Seifi is professional, compassionate and highly skilled. Her patients and associates love her. Dr. Seifi is very compassionate. She emphasises with the patient, understands their situation and provides very good care. Her treatment for Patients is always appropriate and with best interest of the patients. And the last thing that set her apart is she takes care of her peers and the people she works with and tries to help them succeed. Dr. Seifi care about her patients and goes above and beyond in her treatment and service. She is very knowledgeable about dentistry and most important for a dentist she has a vary Caring and soothing attitude. Love her! She is one of the nicest persons I have met and I respect her personally and professionally. In my view, I think Dr. Seifi has great technical skills, very detail explaining procedures and treatment plan to patient, very calm, make patients feel very welcome to the office.